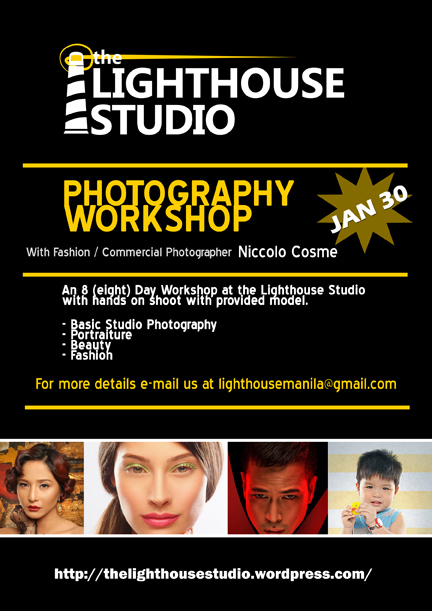 Photography Workshop @ The Lighthouse Studio with Fashion and Commercial Photographer Niccolo Cosme. This 8 day workshop will familiarize you inside the studio and will guide you through in basic studio lighting. The workshop will also focus on portraiture, Beauty photography and a little of Fashion photography! The 7th and 8th day will be a hands on shoot with a professional model provided by The Lighthouse Studio. Workshop starts on the 30th of January! I want to join. More info please? Hi! Kindly e-mail us at lighthousemanila@gmail.com and we will send you a file with the infos regarding the workshop! thanks! Kindly leave your email add so i can send you more details 🙂 or email us at lighthousemanila@gmail.com cheers! hi. how much is it? and pwede pa bang humabol?